What does the term "nut flush" mean? 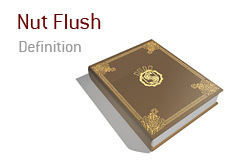 What is the definition of the term "nut flush" in poker? The board reads Qc-Ac-2c-2d-5d. You lead out on the river with a sizable bet and your opponent calls. You turn over Kc-Jc for the nut flush, while your opponent flips over 7c-6c for an inferior flush. You win the hand. The board reads 5c-6c-7c-7d-2d. Your opponent shoves all-in on the river and you make the call. You turn over Ac-Kc for an Ace-high flush, thinking that your hand is best. Unfortunately for you, your opponent flips over 8c-9c for a straight flush (the nut flush in this case) and takes down the hand.